My newsfeed on Facebook is full of comments about back to school related stuff. Deals found, questions related with starting school and parents looking for help about what they need for their university aged kids who are moving away for the first time. Moving away for school is a big step in life. A big, expensive step too. 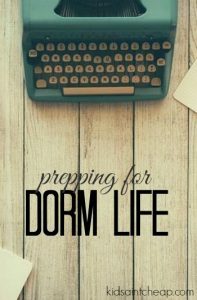 Dorm living is slightly different than living in an apartment or other off-campus living. There are more shared quarters and depending on the style dorm, a room may either be shared (usually just one other person) or single (more money). Ideally you have a chance to actually view the units before you set out to shop. At the very least find out exactly what is included. One of the biggest differences with dorm living vs off campus living is the dining hall. 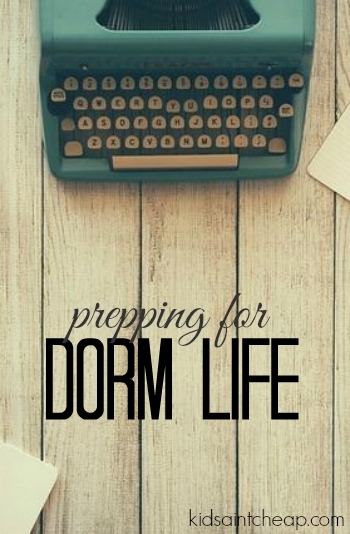 Though not always required, most people who live in a dorm eat within the dormitory cafeteria, limiting what you ‘’need’’ in terms of food prep and storage in your own living quarters. The downside to this is that the cafeterias aren’t open 24 hours a day and sometimes circumstances come up that you don’t want, or simply can’t get to the food when it is served. For this reason I think it is a good idea, regardless of the food situation at the dormitory, to get a few small appliances for your personal use. Some dorm rooms are equipped with things like a mini fridge but most will require you to purchase your own. I personally wouldn’t move to a dorm without the use of my own personal mini fridge (shop after Christmas sales! ), a hot plate to do things like boil water or heat soup, and a toaster oven to cook a few small things in. I personally can get by without a microwave easily if I have access to a hot plate and toaster oven but some may also want that. None of these things are very expensive at full price but knowing you may require them gives you time to shop around. Garage sales or online classifieds may be your best bet. Start searching in May when other university and college students are moving out and looking to offload their items, you may score some wicked deals. If you don’t have any luck- wait until the few weeks leading up to school and your big box stores will likely have sales. In terms of cutlery and plates, hit up your local dollar store or second-hand store. Dorm living is not the place to have nice, quality stuff. If you don’t already have a few basics you can take from home (a few dishes, cutlery, a small pot) don’t waste your money on expensive stuff, it’s just not worth it! If your roommate has a friend over and they break a glass you don’t want to have to worry about it! Though I think you can decorate your dorm with a lot of the things from your current bedroom, the only other things you may need unique to dorm living, is a good storage and organization system specific for small spaces (think under the bed, or small floor shelf). You may also need a few cheap things like shower shoes if you’re in a dorm with shared showering facilities and are concerned with germs (not a bad idea). Dorm living has many pluses, especially for a student moving away from home for the first time and looking to get established somewhere, but it’s not as cheap as some people make it out to be by the time you add up all the additional costs on top of the actual fee for living on campus. Like anything, with a little effort and time you should be able to find everything you need within your budget. If you lived in a dorm what did you absolutely need?